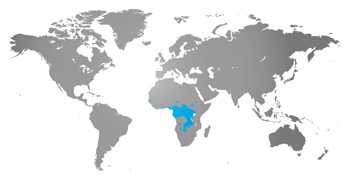 Sitatungas live in swampland and marshes in central and south central Africa in Kenya, Zambia, Botswana, and Democratic Republic of the Congo. Sitatungas live near water so they can feed on fresh grasses in and around the swamps and other bodies of water. At the zoo, sitatunga eat grain and alfalfa hay. What makes them different from other antelope? Male sitatungas can have horns up to 3 feet long which have up to one and a half twists. Their fur is brown, shaggy, oily, and water-resistant, and they have white markings on the face and body. Sitatungas have unusual split hooves that splay when they walk. This helps them avoid sinking into the boggy ground. Sitatungas are very good swimmers and always run to water for cover. Their back end is higher than the front which allows the sitatunga to move very easily and quickly over boggy ground. Also, they are crepuscular, which means they are most active in the twilight hours of dawn and dusk. Sitatungas are easy to find in the swamplands. Because they follow the same routs through the swamp to their feeding grounds, they create “tunnels” through the tall grass. Just follow one of the tunnels, and you’re likely to find a sitatunga. This makes sitatungas easy targets for hunters.